By the light of the moon the friends patiently watched for any signs of the Drink Thief. Skratch had rounded up Wabsworth on the way so he could keep an eye on both him and the Wabbit. Then he hid behind a fence and they all waited. They didn’t have to wait long. From the gardener’s hut behind the bushes came a tinny clanging sound, as if someone had shaken a crate of Wabbit’s Cola. Then one by one, Wabbit’s Cola cans came sailing across their astonished eyes. The cans didn’t shoot around in all directions but proceeded in an orderly way in a straight line, as if they were going somewhere. Skratch jumped and pulled down a can for examination. "Wabbit, this can has a small chip glowing in the side," he said. 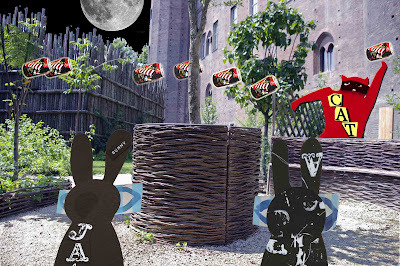 The Wabbit slapped a paw to his forehead. "I forgot the self distributing circuit," he exclaimed, "but it’s new and it's not activated yet." "You mean you programmed the cans to distribute themselves to the shops?" queried Wabsworth. "More or less." said the Wabbit. "More, by the look of things," said Skratch. "Then what about recycling," asked Wabsworth with an interested expression. "That was my plan too," said the Wabbit, "the cans would take themselves to the recycling bank immediately on the best before date." "You go too far Wabbit," said Skratch. "Too far too fast," added Wabsworth. " I know," said the Wabbit and he shook his head. "But Wabbit, who was the Cola drinker who looked like you?" asked Skratch. "That must have been me," said Wabsworth, "but I paid." "How much? said the Wabbit. "€1.50," said Wabsworth. "Disgraceful!" shouted the Wabbit and he thought for a moment. "Where's my money?" he sighed.